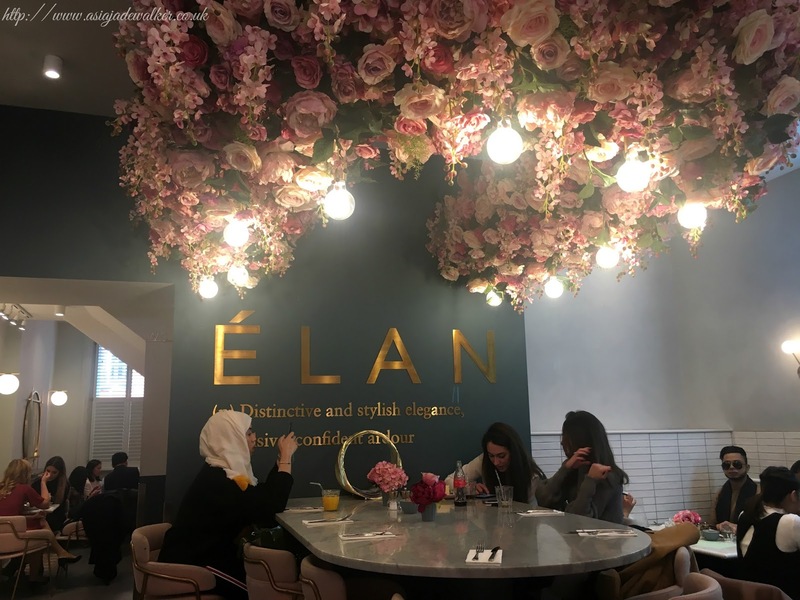 I’m pretty sure by now that every blogger and their mother knows Elan Cafe. Even if you are not a blogger or a YouTuber then you have probably seen it all over Instagram. 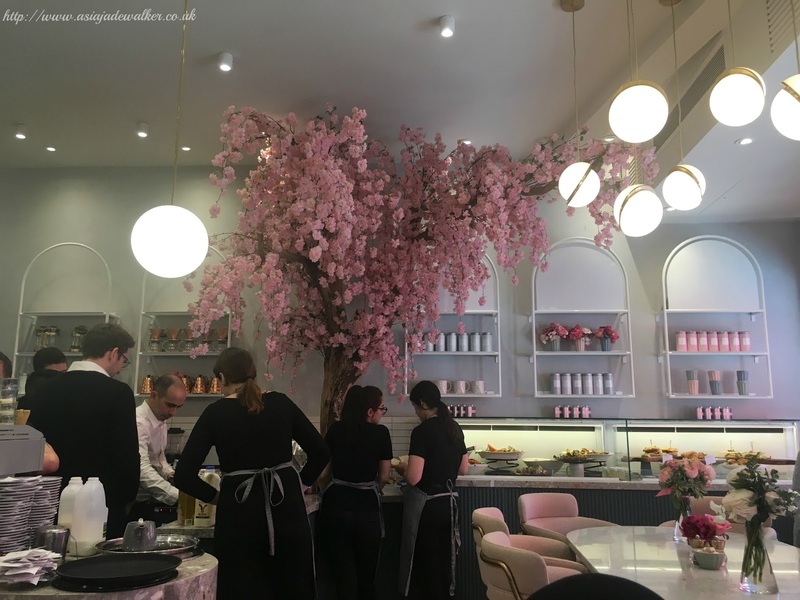 It’s the cafe with the pretty pink flower wall, the one with the huge line of people outside of it or the place with all the delicious cakes in the window. 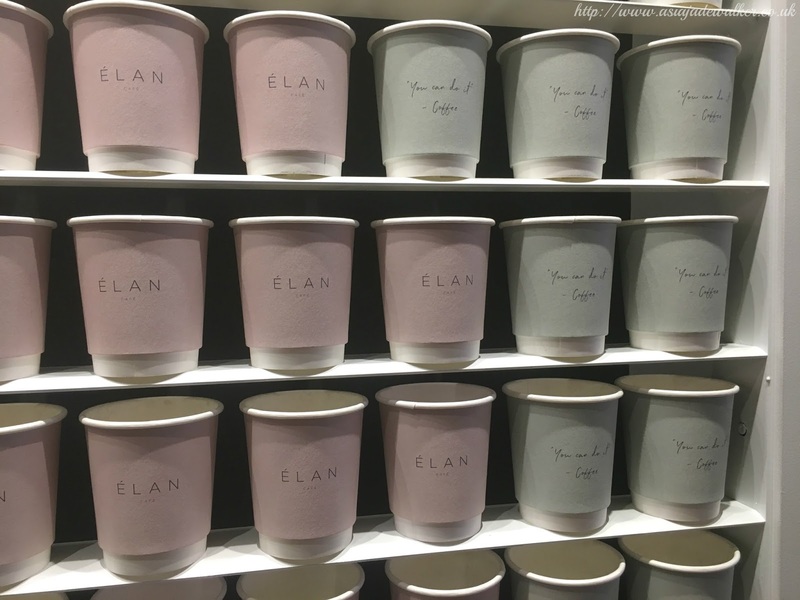 Elan has two cafes one on Brompton Road in Knightsbridge and the other store is in Mayfair on Park Lane. I went to the one in Brompton Road as this one is bigger than the other one and has more things on the menu. 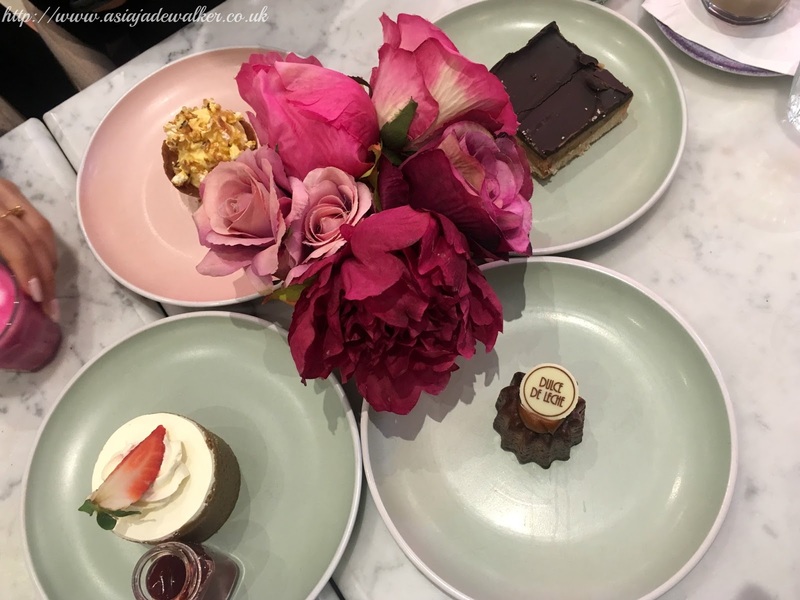 The first time we went was on a Saturday to celebrate my friends birthday however, the line was an hours wait so instead we went to Il Tetto in Selfridges. However, we still wanted to visit Elan so we came back during the week when it would be less busy. I feel like Elan was created for the world of social media. Every part of the cafe has been well thought out. 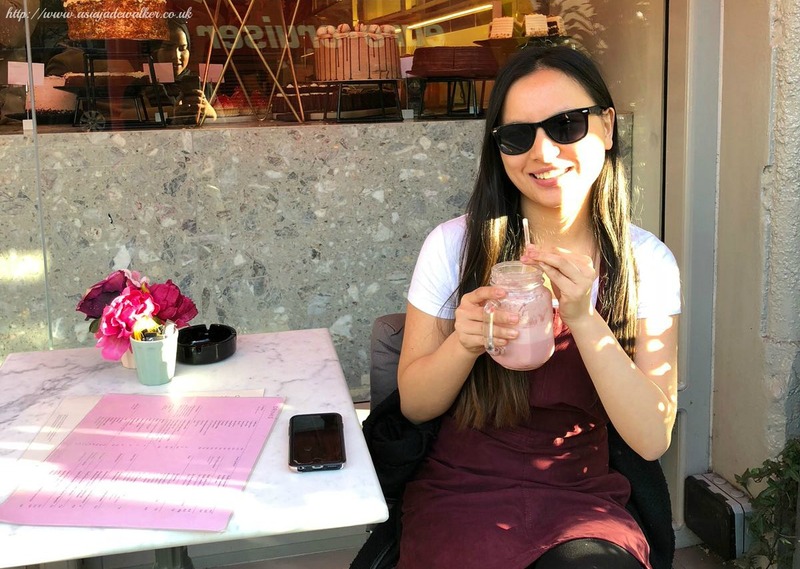 I say the world of social media because it has been one of the most popular cafes of 2018. I have seen it everywhere online whether it’s on Instagra, Twitter, YouTube or peoples blogs. The decor has been designed so that people will want to take photographs. They have chosen to use lots of floral as Instagrammers love a good floral background. Many other places are using floral at the moment as well to encourage Instagrammers to come to their cafe or shop. You probably all know Peggy Porschen who are well known for decorating their front entrance with a floral pattern. 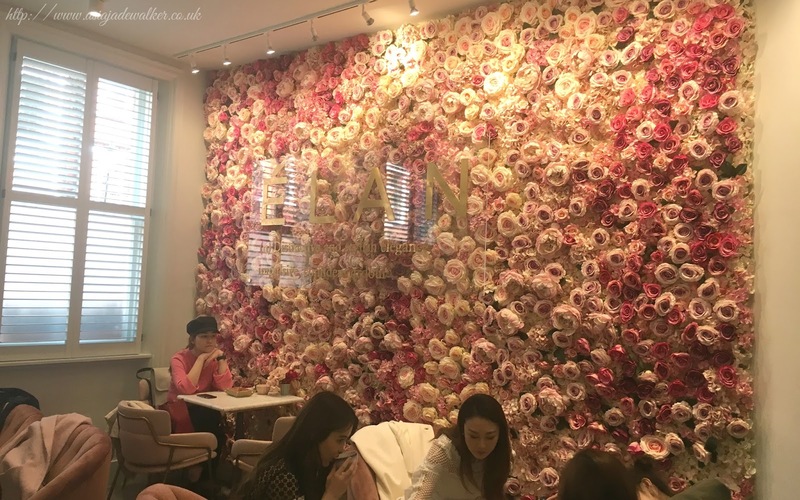 Elan has flowers everywhere and they even have a floral wall which I have seen many bloggers take photos in front of. I love their wall of paper cups as they are color-coordinated perfectly which makes me very happy. Okay let’s talk about the most important part the food and drinks. 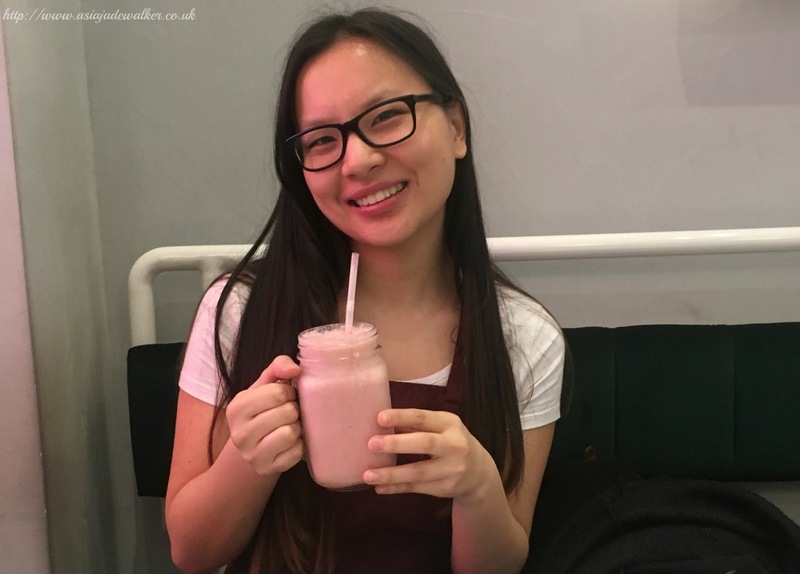 The drink that I got was the strawberry & banana smoothie which was £8.50. To be honest it was awful the smoothie was way too sweet and didn’t taste natural at all. It tasted really artificial I drank about 1/3 of it and in the end I let my friend drink the rest. 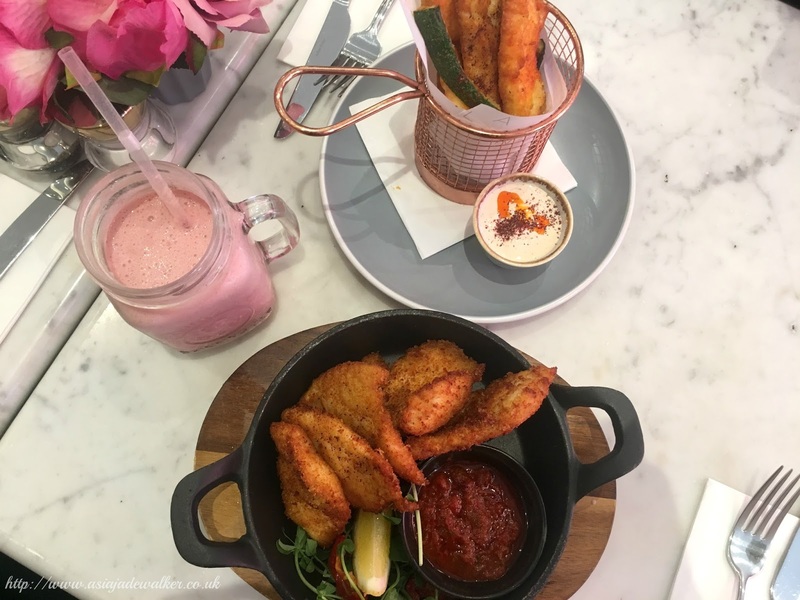 For food, we got buttermilk chicken goujons & courgette and halloumi fries to share, they were both £6.50. The chicken goujons were so yummy and you could tell that they were really fresh. They came with a smoked paprika ketchup which had just the right amount of paprika. I really liked the courgette fries as well as I have never tried them before and also because they are healthy as well. 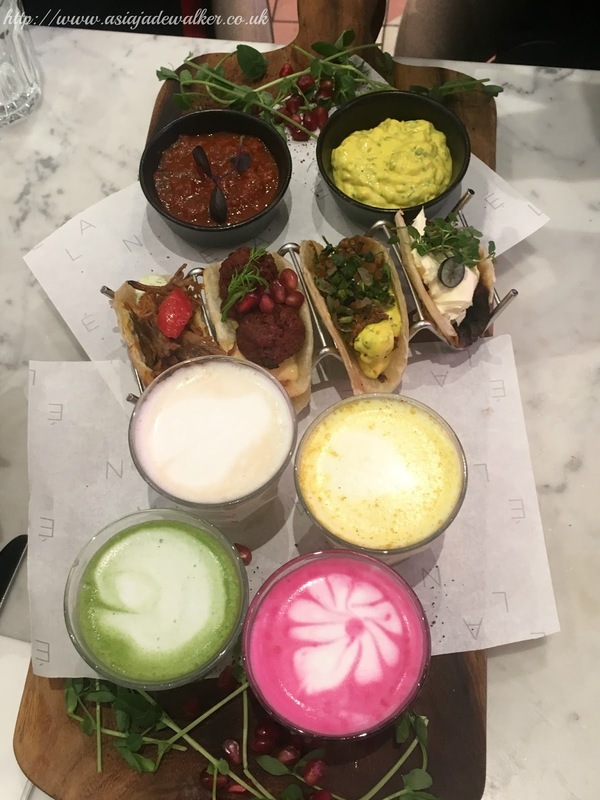 We then got a tasting board which was £17.50 which included Mini Indian chapati tacos filled with pulled lamb topped with minted yogurt and pickles, beetroot falafels with tabouleh soya yoghurt and chilli & coconut crumbed masala cod topped with turmeric tartar sauce. The board was served with four of their signature lattes. To be honest, by the time that the board arrived we weren’t that hungry for it anymore as we had ordered it a lot later than the first two plates. However, when we tried them they weren’t as good as we had expected. I only tried the tacos as I’m not a coffee drinker however, they were dry and did not have much flavor. I’m hoping it was just a bad board as the other food we had was of a higher quality. Moving on to the cakes we got four different ones, however, my friends shared three of them and I had one to myself. We got the popcorn tart which was £4.50, the dulche de leche which was £2.50, the strawberry cheesecake which was £4.50 and the millionaire shortbread which was £4.50. The strawberry cheesecake was the most delicious one even though I only tried a mouthful. The millionaire shortbread was nice but not the best one that I have tasted. I think that I didn’t like it that much as it was made with dark chocolate and not milk. My friends said that the popcorn tart was delicious and that they really enjoyed the dulche de leche as well. Overall, I had a great time at Elan and I’m glad that I went. I think that the cafe is a great place to catch up with friends. Although I would recommend going during the week when it is less busy. I would also suggest choosing wisely on what you get to eat or drink as the prices aren’t cheap. The atmosphere of the place is amazing and it feels like you are surrounded by budding bloggers or Instagrammers as everywhere you look everyone is taking photos.